Who was Joshua? He was the man who succeeded Moses and led the ancient nation of Israel during its conquest of the land of Canaan. The book of Joshua tells us the story of this conquest. But how is such a book relevant for us today in the twenty-first century? In this warm and engaging study, Roger Ellsworth demonstrates the importance of the book of Joshua for today. He shows how the story of Israel in the land of Canaan pictures the life of the Christian in this world, a life of struggle, hardship and conflict. He highlights the truths found in the book of Joshua, which will encourage and comfort Christians in those struggles. Finally, by looking at Joshua, he points us to Christ, our leader and captain. 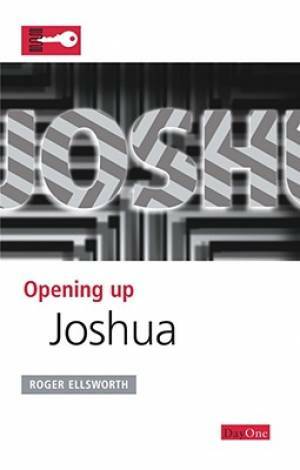 Joshua : Opening Up the Bible by Roger Ellsworth is published by Day One and is our 20879th best seller. The ISBN for Joshua : Opening Up the Bible is 9781846251184. Be the first to review Joshua : Opening Up the Bible! Got a question? No problem! Just click here to ask us about Joshua : Opening Up the Bible.